" SPECIAL COVERAGE: O'Keefe / Breitbart's ACORN 'Pimp' Hoax Revealed	"
Links to The BRAD BLOG's extensive, in-depth coverage of the James O'Keefe / Hannah Giles / Andrew Breitbart ACORN "Pimp" Hoax, as reported in excruciating detail over many months in 2010 and beyond, as the scam was revealed and undone piece by piece. • 4/15/10: What? No Pulitzer Prize for Dirty Tricks?! 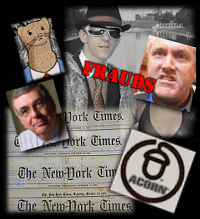 • 4/6/10: NYT's ACORN 'Pimp' Finally Goes Missing?